Daniel Idema Event #27 Champion! The $10,000 Limit Hold’em Championship is one of the most prestigious tournaments held at the annual World Series of Poker. It also has a reputation as being one of the toughest. This year 153 players began Event #27 and played three grueling days of poker. In the end, only one man remained to claim the WSOP gold bracelet and the $378,642 first-place prize. That man was Daniel Idema, who redeemed himself after finishing runner-up in this very event just one year ago. Day Three began with just 14 players including Matthew Gallin, who entered as chip leader with 575,000. Joining him were some tough competition in last year’s runner-up Daniel Idema; three-time bracelet winner and Team PokerStars Pro (USA) Barry Greenstein; runner-up in the 2009 WSOP $40K NLHE tournament, Isaac Haxton; Microsoft millionaire Richard “Quiet Lion” Brodie; online sensation Justin “Boosted J” Smith; and Nick Schulman, who has numerous titles to his credit including a WSOP bracelet in the 2009 $10K No Limit Deuce-to-Seven Draw event. As Day 3 progressed, five players succumbed to the high betting limits. They included Marwan Abdelal (14th- $24,060), Matt Hawrilenko (13th- $24,060), Tam Hang (12th- $28,990), Darren Woods (11th- $28,990), and Hoyt Corkins (10th- $28,990). Their eliminations brought about the official WSOP Final Table, with Daniel Idema’s stack of 740,000 leading the pack. 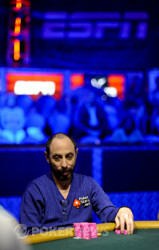 The first final-table elimination came when Schulman ran pockets nines into Greenstein’s pocket sevens on a flop. The turn and river changed nothing and Schulman was sent packing in ninth place ($35,519). Next out the door was Brodie who grew short stacked and couldn’t improve his against Greenstein’s . It took a long time before the next elimination, but it finally came when Haxton got his stack in preflop with againt the of Landfish. The board ran out to give Landfish a flush and send Haxton out the door in seventh place ($55,908). Not long after, short-stacked Smith got his chips in with against Greenstein’s . The board ran out and Boosted J followed Haxton out the door in sixth place ($71,897). Five-handed action lasted a long time, which was surprising considering the high blinds. It just seemed like every time a player was all in, they doubled. That all changed when Denotaristefani raised on the button only to have Landfish snap three-bet from the small blind. Denotaristefani made the call and watched as the came down on the flop. Landfish led out, Denotaristefani raised, Landfish three-bet, and Denotaristefani called off his last 35,000. Denotaristefani’s tournament life was at stake but he was way out in front. The turn changed nothing and left Landfish looking for one of two remaining nines on the river to steal the pot and eliminate his opponent. When the spiked on the river, Landfish slapped the table in celebration. Denotaristefani's supporters fell deafly silent as their man was eliminated by a two outer. 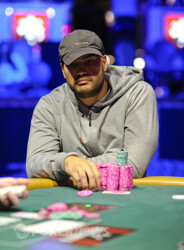 Denotaristefani took home $94,029 as he made his exit in fifth place. Landfish’s luck ran out soon thereafter when he ran into the of Gallin. Three-handed play didn’t last long either as Greenstein received a bad beat after getting it all in with against the of Gallin on . Unfortunately for the fan favorite, the turn came the followed by the on the river. Heads up play lasted less than five hands as Idema entered with a commanding chip lead of 3.6 million to Gallin’s 900,000. 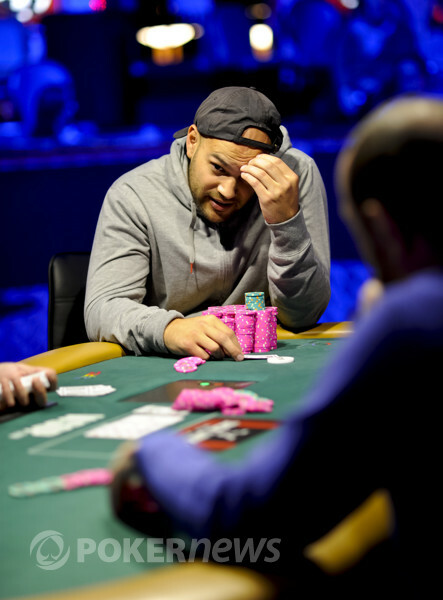 While Idema hadn’t eliminated any opponents up to that point, he steadily increased his chip lead throughout the final table; in fact, he was the only player who was never all in during final-table play. His perseverance and patience paid off when he cracked Gallin’s pocket queens by flopping two pair. After suffering with the title of $10,000 Limit Hold’em Championship runner-up for a year, Idema has validated himself and found redemption as he claimed the title of Champion! 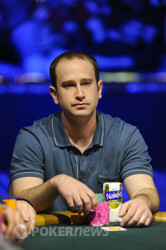 Congratulations to Daniel Idema on capturing his first bracelet and becoming the 2011 WSOP Limit Hold’em Champion. That does it for our coverage from Event #27, but there are still plenty of more events to track in the coming weeks, so be sure to check back soon. Daniel Idema raised on the button and Matthew Gallin three-bet from the big blind. Idema made the call and on all three streets of the board, Gallin led out and Idema called. Gallin turned over but Idema had him bested with . The hand crippled Gallin all the way down to 330,000. The next hand, Gallin raised on the button and Idema called from the big blind. On the board, Idema checked and Gallin bet. Idema came back with a check-raise that put Gallin all in who made the call. Idema was ahead with two pair although Gallin could still win the hand by hitting trips or a higher two pair. The on the turn kept Idema in the lead and Gallin would now need a seven, eight or queen on the river to survive and double up. Unfortunately for him, the river was the and he would be eliminated in second place as the runner up. After having been grinded all the way down to around 200,000, Barry Greenstein raised from the small blind and Matthew Gallin called from the big. On the flop, Greenstein led out and Gallin went into the tank. He eventually raised which put Greenstein all in who called. Greenstein was in dominating position and in great shape to double up. The turn was the which gave Gallin some additional outs. He would need a two or five to knock out Greenstein while a three would chop the pot. The river was the and Gallin sucked out to win the hand. He finally received his copy of ‘Ace on the River’ that he was so close to getting earlier from Greenstein who was eliminated. Matthew Gallin raised uner the gun only to have Steve Landfish raise from the small blind. The duo eventually got all their chips in the pot, and surprisingly both had the same exact amount of chips (290,000). Barring a chop, one player was going to be eliminated. Landfish was dominated and in big trouble. We'd like to say he at least got a sweat out of it, but the board ran out a dry and Gallin's aces held. Landfish shook hands with the remaining player before heading to the payout desk to collect his $125,120. Not a bad showing for the man who finished runner-up in the $10K Stud Championship earlier in the week, which will no doubt push him toward the top of the WSOP Player-of-the-Year race. It was folded around to Matthew Gallin who moved all in from the small blind for 145,000. Daniel Idema made the call for 85,000 more and the players showed their hands. Gallin was in a race for his tournament life but that quickly changed when rolled out on the flop to give him a full house. Idema would need a running miracle to win the hand but the on the turn had him drawing dead and the on the river sealed the deal to double up Gallin. On a flop of in a blind-vs-blind situation, Matthew Gallin bet from the small blind only to have Dan Idema raise from the big. Gallin made the call and then check-called a bet on the turn. The same action occurred on the river and Idema rolled over for trip kings. Gallin seemed frustrated as he flicked his cards in the muck, dropping to 300K in the process. Meanwhile, Idema is pulling away from the pack with 2.5 million and looking to accomplish what he failed to do last year, clear the entire field and capture the bracelet. Steve Landfish raised from the small blind and Barry Greenstein called from the big. On the flop, Landfish led out and Greenstein raised. Landfish ended up all in and the players showed their cards. Greenstein's pair was behind that of Landfish. The turn and river bricked out which gave Landfish another double up. False Alarm: Berry Greenstein thought he was busting, but he doubled up. 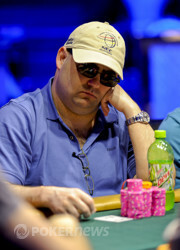 Justin "Boosted J" Smith is eliminated in 6th place by Barry Greenstein. Justin "Boosted J" Smith is eliminated in 6th place. Isaac Haxton out in 7th place.